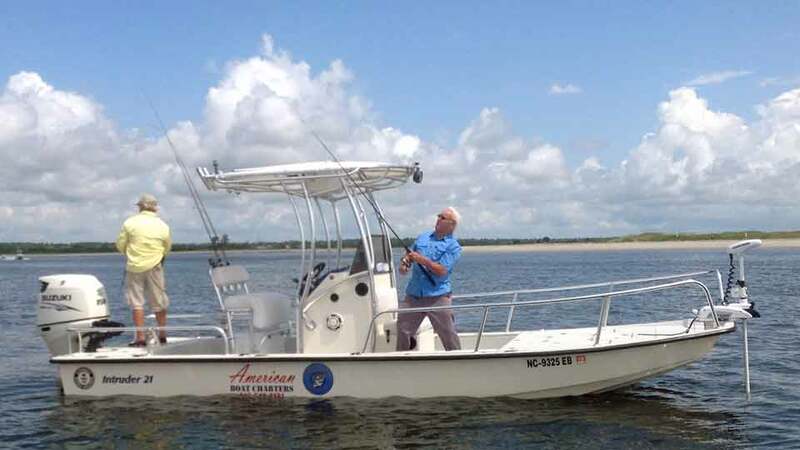 American Boat Charters fishing trips are perfect for anyone looking for a great experience on the water, whether in Wrightsville Beach, Carolina Beach or Topsail Island, North Carolina. With years of experience fishing along the Cape Fear Coast, we know what it takes to give you, your friends or your family a fun and professional fishing trip! With our inshore fishing charters, we will visit the waters of the Intracoastal Waterways, as well as salt marshes and tidal creeks. We will be going for such species as Red and Black Drum, Speckled Trout, Sheepshead, Flounder…etc. For our off the beach fishing trips, we will target species such as King Mackerel, Spanish Mackerel, Mahi Mahi, Black Sea Bass, Amberjack, Grouper, Ocean Flounder, Gray Trout, Blue Fish, Cobia, Atlantic Bonito, False Albacore (Little Tunny), Red Drum, Black Drum, Sharks…etc. The different methods of fishing include casting, trolling, live bait fishing, balloon fishing, bottom fishing or Carolina Rig methods or jigging off the bottom. Our fishing charters are anywhere between 4 to 10 hours. We can carry up to 6 anglers. Although on our off shore trips, we prefer, for your comfort, to only have up to 4 anglers. , as well as ice and packing for the fish you catch during your trip. The entire day is all about YOU and to give you a great experience you’ll never forget. Book your “Day On The Water” with Captain Von.